Can eating a certain healthy food really make us happier and give us energy? According to research recently published in the Journal of Nutritional Science, eating two kiwi fruit each day can do just that. The 6-week long study involved 54 healthy young male university students who were divided into two groups. One group ate half a kiwi daily and the other ate 2 kiwis daily. Previous research has indicated that eating half of a vitamin C rich kiwi fruit daily increases plasma vitamin C in people who do not eat a lot of fruit and vegetables. However, this new study found that to completely saturate the plasma, 2 kiwis are needed. Participants in the two kiwi a day group experienced less fatigue and depression and more energy than those in the half a kiwi group. What Makes Kiwifruit so Special? Kiwifruit originated in southern China and is the National fruit of China. Kiwi makes the list for one of the World’s Healthiest Foods according to the The George Mateljan Foundation. The most common kiwi species is Actinidia deliciosa or the Hayward kiwi. This fruit is small and oval-shaped with brown fuzzy skin and brilliant green flesh. Kiwifruit are an excellent source of vitamin C, polyphenols and potassium. Humans, monkeys and guinea pigs do not make vitamin C on their own and must have it added to their diets. Vitamin C protects the body from the effects of acute and chronic stress, fights free radicals and is an integral part of a number of metabolic reactions including collagen synthesis and wound healing. A great many health benefits can be derived from consuming foods rich in vitamin C on a daily basis. A study published in the American Journal of Clinical Nutrition found that short-term vitamin C therapy improved mood and reduced psychological distress in acute patients with low vitamin levels. A Korean Study, published in the Nutrition Journal studied the benefit of intravenous vitamin C on fatigue and stress. The study was a double-blind, randomized trial that involved 141 healthy office workers. The study participants were divided into two groups. One group received a high dose of vitamin C intravenously (10g) and the other group received a saline solution. Researchers measured fatigue levels, oxidative stress and levels of plasma vitamin C before the treatment and two hours and one day after the treatment. The results of the study showed that those that received vitamin C had a great deal more energy even just two hours after the infusion than did the group who did not receive vitamin C. This increase in energy persisted for up to 24 hours. The vitamin C group had higher levels of serum vitamin C and less markers of oxidative stress. The high amount of potassium in kiwi keeps electrolytes in balance. Kiwifruit has been studied for its antioxidant powers that help protect the cell DNA from oxidative damage. Some feel this may help prevent cancer. 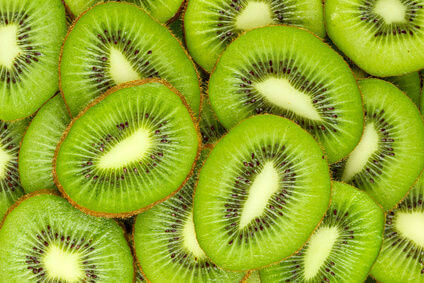 Because of its high vitamin C content and other antioxidants, kiwifruit can boost the immune system. Kiwifruit has a low glycemic index and is high in fiber, which means it will not create an insulin rush that prompts fat storage, like some other fruits. Note: We encourage you to shop for organic kiwis when possible. Hey Buddy!, I found this information for you: "Don’t Worry Be Happy: Eat 2 Kiwi Fruit a Day". Here is the website link: https://www.thealternativedaily.com/dont-worry-happy-eat-2-kiwi-fruit-day/. Thank you.